Following on from my May's Favourite post, a couple of you mentioned about the Beauty Elixir and were unsure whether to splash your cash. 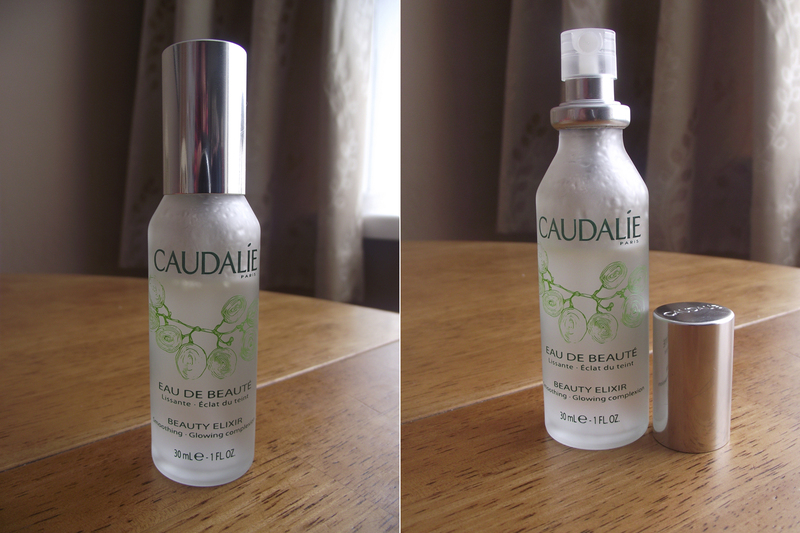 So as promised I thought I would share my thoughts with you all, on the favoured Caudalie- Beauty Elixir*. Some people have mentioned they think it's a little over priced and to be fair if this is the first time for you to try it I would say to try the smaller size first. That way it's not going to break the bank and plus it will still last ages and gives you a good idea whether you're going to like it. Then if it's a hit for you, you can then invest in the larger bottle which does work out better value for money but I think it's a lot to spend initially on a product which you're not sure about. The bottle is made from frosted glass and gives a very opulent feel about it, in other words it'll withstand a bit of bashing in your handbag! The Caudalie Beauty Elixir isn't just loved by beauty bloggers, it's also loved by celebrities one of which is the very famous Victoria Beckham and also used by Queen Isabelle of Hungary. Caudalie claims to tighten pores, smoothes features, and provides an instant burst of radiance to the complexion. There's been a lot of talk around the scent of the Beauty Elixir and if you really have a dislike to mint then I wouldn't recommend this, the scent can be overpowering at times. The main ingredients which make the Beauty Elixir great at it's job is the mix of essential oils- grape, rosemary, orange blossom, rose extracts, myrrh essential oil and organic balm mint. The scent has grown on me and I've actually been using it for lots of things, I use it before applying my moisturiser as recommended. I then apply it over the top of my foundation/BB cream to help set my skin for the day. I got mine just before I went on holiday just when we had the heat wave and I kept experiencing headaches, especially with the travelling I also felt groggy. I normally use my forehead and then went to reach inside my bag and pulled this out! Since then I've been using it to help relive the start of a headache. It's great for travelling and awakening the senses, that I can agree to and say yes it does. I've not noticed my pores getting any smaller as of yet but I do still have a lot of product left. I've also heard this is amazing for acne prone skin, especially if you feel your face is melting off half way through the day this would be an amazing pick me up to help refresh your skin. I've been using this daily at least a handful of times and I still have 3/4 left, you do need to shake the bottle before spritzing because the essential oils do sit on the surface of the Elixir. So we will you treating yourself to the amazing Caudalie- Beauty Elixir? I just bought some from Feel Unique and am loving it! The smell was a shock at first but I find it really refreshing now that I'm used to it - think I just expected it to be more floral. I love this, the smell everything. I am onto my 2nd bottle and am waiting for it to come back on BuyaPowa so I can get the 100ml bottle. I usually spray onto my hands and then press into the skin. It also works well on a cotton pad swiped across the face. I am not sure whether this had had any actual skincare benefits as such but it does wonders in refreshing and reducing the redness. @Ms Bubu- Yes you'll love it for freshening up through the day. I've been experiencing the same thing, feeling like my face is melting off!